The differential in your vehicle has very important functions; it acts as the final gear reduction between your transmission and drive wheels as well as allowing for the difference in speed between your two drive wheels while cornering. When you are turning, the outside wheel on your car travels faster than the wheel on the inside of the turn. In a real tight turn, it is even possible that the inside wheel could actually move backward. If the drive axle on your car was one solid piece this difference in speed between the two wheels would cause HUGE problems. In most cases, the rear end is just another name for your differential. it is the big “bump” between your wheels at the rear of your car. The differential is housed within that bump. 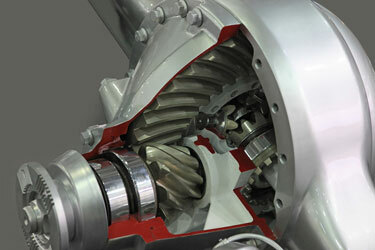 That is where all the reduction and slip gears are that let the differential do its magic. A whining or rumble coming from the rear of the vehicle could be a sign of a differential that is in need of repair. Also, a loud clank when going from sitting still to moving should be checked out. If the noises and symptoms seem to be worse when coasting as compared to accelerating under power is also a red flag that you should have your differential checked out. A bad differential or transfer case could cause serious and expensive damage to other components on your vehicle such as your transmission, not to mention also creating an unsafe driving condition.